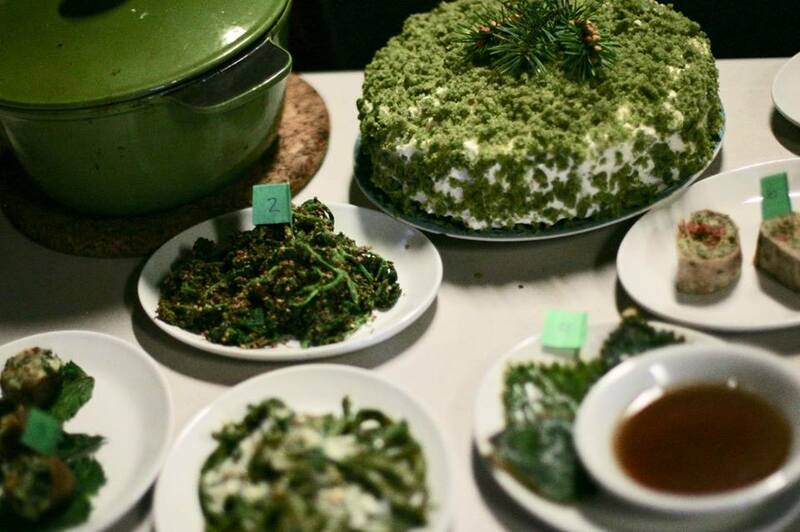 These recipes are from Nettlefest 2008, a celebration by the Galiano Community Food Program. WILD NETTLE AND POTATO SOUP – Serves 8. 4 tablespoons olive oil, 2 cups chopped onions, 2 pounds Yukon Gold potatoes,peeled, cut into 1-inch pieces, 8 cups (or more) water, 2 bay leaves, 1/2teaspoon dried crushed red pepper, 4 garlic cloves, minced, 15 oz. (300g) fresh nettle leaves, stems trimmed (use gloves! ), Sour cream and chopped parsley for garnish. -Heat 4 tablespoons oil in heavy large pot over medium heat.Add onions and saute until tender and golden, about 8 minutes. Add potatoes; saute 3 minutes. Add garlic and saute for another 2 minutes. -Add 8 cups water, bay leaves and crushed red pepper. Bring to boil. Reduce heat. Simmer until potatoes are tender, about 20 minutes. Add nettle leaves just before blending to preserve brightness. -Working in batches, puree soup in blender until smooth.Return soup to pot. Bring to simmer, thinning with more water, if desired.Season soup to taste with salt and pepper. To serve: top each bowl with a dollop of sour cream and a bit of chopped fresh parsley. 1 cup raw almonds, toasted in a dry pan stirring constantly, 8 cloves or 1/2large head garlic, 1 teaspoon kosher salt, 1/2 teaspoon freshly ground black pepper, 7 cups nettle leaves (blanched and drained), 6 cups loosely packed fresh spinach leaves, 1.5 cup extra-virgin olive oil, 3 cups finely grated parmesan cheese. Roast almonds and coll them completely. With food processor running, drop in whole garlic cloves. Process until finely chopped, then stop motor and add cooled nuts, salt, pepper, nettles, spinach. Process until finely chopped. With motor running, add oil and process until incorporated. Fold in grated cheese. Special equipment: a 9-inch (24-cm) spring form pan; parchment paper. Put oven rack in middle position and preheat oven to 35o°F. Grease spring form pan with some oil, then line bottom with a round of parchment paper.Oil parchment.Finely grate enough lemon zest to measure 1 1/2 teaspoons and whisk together with flour. Halve lemon, then squeeze and reserve 1 1/2tablespoons fresh lemon juice. Beat together yolks and 1/2 cup sugar in a large bowl with an electric mixer at high speed until thick and pale, about 3 minutes. Reduce speed to medium and add olive oil (3/4 cup) and reserved lemon juice, beating until just combined (mixture may appear separated). Using a wooden spoon, stirin flour mixture (do not beat) until just combined. Beat egg whites (from 4eggs) with 1/2 teaspoon salt in another large bowl with cleaned beaters at medium-high speed until foamy, then add 1/4 cup sugar a little at a time,beating, and continue to beat until egg whites just hold soft peaks, about 3 minutes.Gently fold one third of whites into yolk mixture to lighten, then fold in remaining whites gently but thoroughly.Transfer batter to spring form pan and gently rap against work surface once or twice to release any air bubbles. Sprinkle top evenly with remaining 1 1/2 tablespoons sugar. Bake until puffed and golden and a wooden pick or skewer inserted in center of cake comes out clean, about 45minutes. Cool cake in pan on a rack 10 minutes, then run a thin knife aroundedge of pan and remove side of pan. Cool cake to room temperature, about 1 1/4hours. Remove bottom of pan and peel off parchment, then transfer cake to a serving plate. Using electric mixer, beat cream cheese and butter in large bowl until light and fluffy. Gradually beat in powdered sugar. Beat in lemon peel and vanilla. Cover and refrigerate until just firm enough to spread, about30 minutes. 1.5 cups water, 1/2 cup sugar, 1/2 cup fresh nettle leaves, 6 tablespoons fresh lime juice. Line the bottom and sides of an oiled 8-inch square glass baking dish with a piece of plastic wrap, smoothing out wrinkles.Sprinkle gelatin over 3/4 cup water in a 2-quart saucepan and let stand 1 minute to soften. Heat mixture over low heat, stirring occasionally, until gelatin is dissolved. Stir in remaining water, sugar, and nettles, then simmer, stirring occasionally, 5 minutes. Remove from heat and let stand, uncovered, while nettle steeps, 20 minutes.Stir in lime juice and remaining cup water, then pour through a fine sieve into baking dish and chill, covered, until firm, at least8 hours.